The Global Justice Reader is a first-of-its kind collection that brings together key foundational and contemporary writings on this important topic in moral and political philosophy. Thom Brooks is Reader in Political and Legal Philosophy at the University of Newcastle and founding editor of the Journal of Moral Philosophy. He is the author of Hegel’s Political Philosophy (2007) and Punishment (2008), as well as editor of Rousseau and Law (2005), Locke and Law (2006), and co-editor of The Legacy of John Rawls (2005). 2. A State of Nature: Charles R. Beitz. 3. Cosmopolitanism and Sovereignty: Thomas W. Pogge. PART II: Rights to Self-Determination:. 4. National Self-Determination: Avishai Margalit and Joseph Raz. 5. Theories of Secession: Allen Buchanan. 6. Universal Declaration of Human Rights: United Nations. 7. The Nature of Rights: Leif Wenar. 8. Human Rights as a Common Concern: Charles R. Beitz. 9. Group Rights and Group Oppression: Peter Jones. 10. What’s Wrong with Torture? : David Sussman. PART IV: Rawls’s The Law of Peoples:. 11. The Law of Peoples: John Rawls. 12. An Egalitarian Law of Peoples: Thomas W. Pogge. PART V: Nationalism and Patriotism:. 13. What is so Special about our Fellow Countrymen? : Robert E. Goodin. 14. The Ethics of Nationality: David Miller. 15. Patriotism and Cosmopolitanism: Martha C. Nussbaum. 16. Perpetual Peace: Immanuel Kant. 17. Kant’s Idea of Perpetual Peace, with the Benefit of Two Hundred Years’ Hindsight: Jürgen Habermas. 18. Moral Universalism and Global Economic Justice: Thomas W. Pogge. PART VII: Global Poverty and International Distributive Justice:. 19. Famine, Affluence, and Morality: Peter Singer. 20. What We Owe to Distant Others: Leif Wenar. 21. The Problem of Global Justice: Thomas Nagel. 22. Eradicating Systemic Poverty: Brief for a Global Resources Dividend: Thomas W. Pogge. 23. Poverty Relief, Global Institutions, and the Problem of Compliance: Lisa L. Fuller. 24. War, Sedition, and Killing: St. Thomas Aquinas. 25. A Few Words on Non-Intervention: John Stuart Mill. 26. Charter, Chapter VII: United Nations. 27. War and Massacre: Thomas Nagel. 29. Just Cause for War: Jeff McMahan. 30. Noncombatant Immunity and Military Necessity: Michael Walzer. 31. Terrorism without Intention: David Rodin. 32. Terrorism, Justification, and Illusion: Saul Smilansky. PART X: Women and Global Justice:. 33. Is Multiculturalism Bad for Women? : Susan Moller Okin. 34. Capabilities as Fundamental Entitlements: Sen and Social Justice: Martha C. Nussbaum. 35. The Role of Religion: Martha C. Nussbaum. 36. Conceptualizing Women’s Human Rights: Carol C. Gould. PART XI: International Environmental Justice:. 37. One Atmosphere: Peter Singer. 38. Cosmopolitan Justice, Responsibility, and Global Climate Change: Simon Caney. 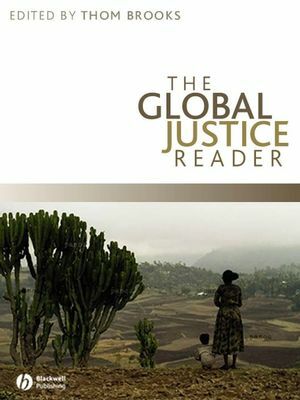 "The Global Justice reader is an important work of our time. It means that we can chart the development of the idea of justice in terms of the themes that occupy our world today. This book is a great idea about a great idea." "Thom Brooks' The Global Justice Reader fills an urgent need for those who teach the philosophical dimensions of global issues, and their students. Brooks has pulled together an interesting and provocative set of articles, many of them classics in their fields. This book will set the benchmark against which others will be judged." "This is both the broadest and the deepest selection of texts on morality beyond borders. Those looking for sharp analyses of crucial issues in global justice will find this collection clearly the best choice."